Coco Chanel's quotes still hold true to this day. She remains the epitome of timeless, classic style and good taste, and she was never one to hold back on the sartorial wisdom. The famed designer and Chanel founder had strong opinions about the way a woman should and shouldn’t dress—from what makes someone stand out to the dos and don'ts for anyone looking to be taken seriously. 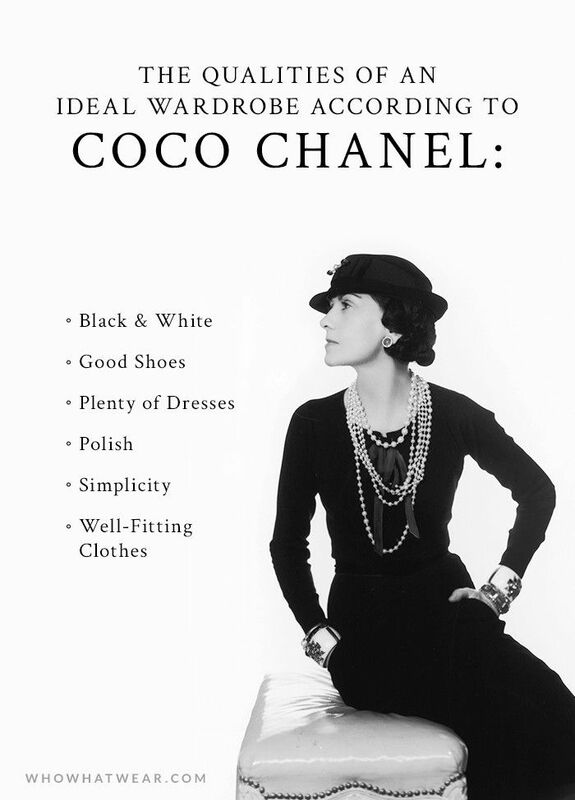 Many of these rules still apply to signature Chanel fashion codes today. While at times, her musings on style are undeniably blunt (a trait her successor Karl Lagerfeld has certainly kept alive), there is much to take away from them. In fact, it’s even possible to build a wardrobe around her thoughts on style. There are key points made by the elegant trailblazer on everything from the best colours to wear (take a wild guess) to the accessory that can make or break an outfit. As arguably one of the most important icons in the history of fashion, what she says goes. Scroll down to see the makings of a CC-approved wardrobe and what the legend has to say about them. Keep scrolling to shop the pillars of the Parisian fashion house. Next up, 50 of the best fashion quotes of all time.